No. 17, Jalan Anggerik Mokara 31/63, Seksyen 31, 40460 Kota Kemuning, Shah Alam, Selangor, Malaysia. located in Klang Valley and within Malaysia. businesses with the manufacturing companies. 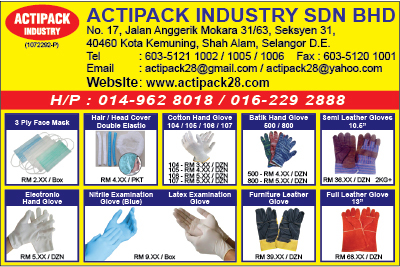 Industrial Safety Products, Industrial Hardware Products, Printing, Signage etc. have won continuous support and business from its ever growing customer base.